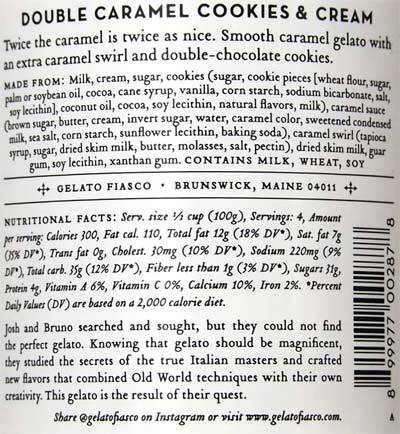 [New for 2018] Ok, time to finally show you one of the other free samples Gelato Fiasco sent over two months ago. I covered all the new nutty options then, but what about the one that toys with my favorite classic flavor: Cookies & Cream. You may have (subtly) noticed in the pint shot how the base color got darker as you go from left to right. I thought it was lighting at first, but no, that's the salted caramel swirl. 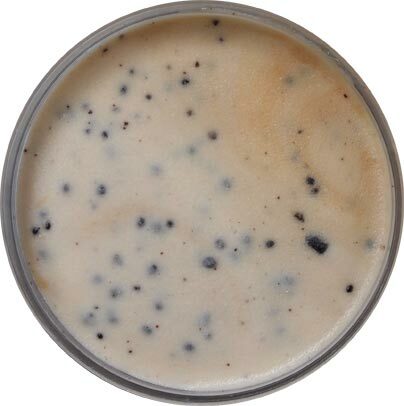 To cut to the chase, cookies & cream is a very specific and very classic thing. This pint technically isn't cookies & cream. Sure, it's literally C&C, but not in the spirit of what you might be used to. The round cookie bits take some getting used to. Plus, there's no tiny cookie crumbs to add that classic flavoring to the base. Now the caramel is caramel without being too caramel. It's not buttery or burnt, just fairly in check so as to try and let the cookie bits do their thing. Technically the swirl is salted but it didn't really hit me as such until I stopped eating and I noticed the salty caramel aftertaste. Despite not falling instantly in love, it was easy to keep scooping on. I prefered the softer edges with the numerous bits mixed in. I just liked it better that way. The cookie flavoring did slowly start to build, but with almost half the pint now gone, I would have liked it to be stronger. So, my point? This is not a classic flavor and you can't go in to it as such. Wait, you know what this reminds me of? 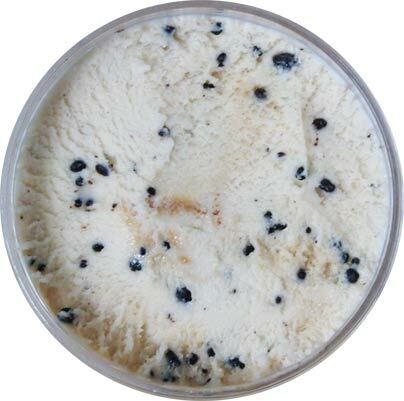 Talenti's Caramel Cookie Crunch. This is totally that flavor. I know companies don't necessarily like when I point out stuff like that, but it is what it is. Anyway, I suspect the second scooping will go better now that I know what to expect. On Second Scoop: Different expectations did lead to a more enjoyable experience. 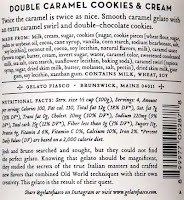 I thought more about Talenti and less about cookies & cream and that helps. 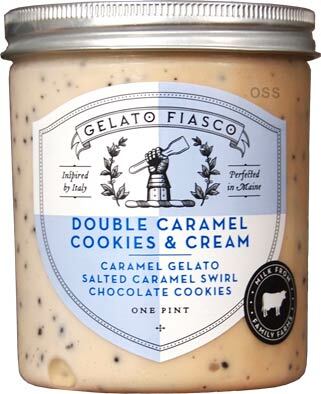 Well, it's a saltier version of Talenti's take anyway. Different can be good, but I do not like the lingering aftertaste, it's too salty for my liking. In it's defense, I don't like lingering salty aftertastes which probably sounds weird from a guy who loves chips and pretzels. It's just that salty flavor and salty aftertaste are not the same thing to me. So this isn't so much a case of a bad flavor, so much as it's not going to lock in with my particular ice cream preferences. I want to love it but I can't. I guess the question I should ask is: do you like that bit of saltiness in your ice cream? I'm fine with salty mix-ins but I don't think I like having the salt intertwined with every bite. Not sure I’d like that level of salt, but I will still try it. I have their new “Sunken Treasure” to try this weekend. That one has salted pretzels. I really love Haagen Dazs Peanut Butter Salted Fudge a lot. Also enjoyed the Honey Salted Carmel. So overall I’ve been pretty happy with this salt trend. To answer your question *mostly* no, or leaning toward the spectrum of "no". I'm saying *mostly* because I do love the subtle saltiness of graham, cookie or batter swirls and cookie dough chunks. But those are not as salty as say "salted caramel". The average person wouldn't perceive them as salty whatsoever. The last (and probably only) time I enjoyed an ice cream with salted caramel was Ben & Jerry's New Belgian Ale ice cream with brownies. I enjoyed it, but not enough to repurchase it. I only got it because the Scoop Shop was no longer carrying what I came for. I didn't regret my purchase but it wasn't for me. So yeah, with the one exception being McGriddles (don't judge me) I like to keep my salt and my sugar seperate. Unforuntately that was the one flavor that wasn't in my free sample pack but hopefully I will try it at some point.